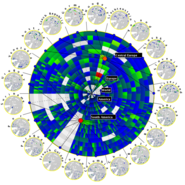 We surveyed the field of dynamic graph visualization in a EuroVis 2014 State-of-The-Art Report (STAR). 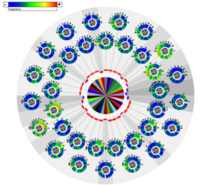 Already more than 120 papers have been published in this growing field of research, among them about 60 unique visualization techniques. We classified the techniques into a simple hierarchical taxonomy and made our literature collection also available as an interactive database. 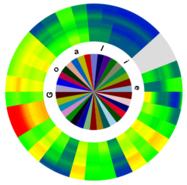 Taxonomy of dynamic graph visualization techniques. In our research we avoid a time-to-time mapping and encode the time dimension into space instead. We use stacked graphical color coded elements to show weighted time-varying relations and we show links only implicitly by different orientations instead of direct explicit links as in node-link diagrams. run time complexities are reduced and graphs can be added on-the-fly.